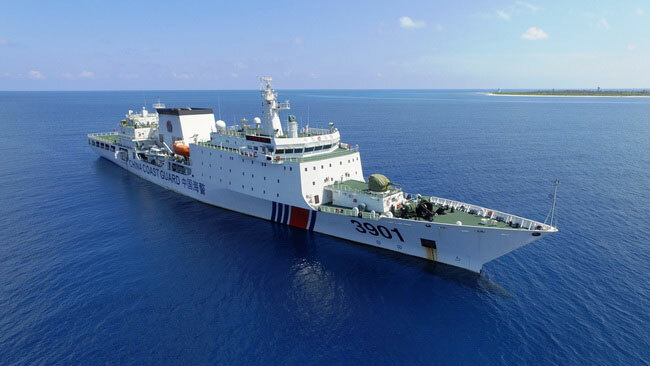 Image Attribute: 12,000 ton China Coast Guard (CCG) 3901 cutter No. 1123 patrols claimed islands in the disputed South China Sea. According to the latest news report, China’s Central Military Commission (CMC) will take over the controls of China Coast Guard (CCG) from July 1. This transfer is going to be from civilian domain to military one. Earlier in March 2018, a decision on maritime rights protection and law enforcement by the China Coast Guard was approved by the Standing Committee of the 1st Session of 13th National People's Congress (NPC). Since 2013, the CCG earlier functioned under the leadership of State Oceanic Administration (SOA) but also took guidance and instructions from the Ministry of Public Security and now it will start to serve their duties under the oversight of the People’s Armed Police Force (PAPF/PAP). Since January 1, 2018, command of the PAPF/PAP is jointly held by the Central Committee of the Communist Party of China and the CMC, with the PAPF/PAP no longer subordinate to the State Council. Till 2013, China had "five dragons" that govern the Sea  — they were: 1. Maritime Safety Administration (MSA), 2. China Fisheries Law Enforcement Command (FLEC), 3. China Marine Surveillance (CMS), 4. China Maritime Police Bureau (CMPB), and 5. Customs Police. All five different and independent departments held the responsibilities of enforcing Chinese maritime law simultaneously. On July 22, 2013, based upon a notice published by the State Council , the new SOA and CCG were established officially through restructuring. The only one department that was not included in the restructuring activities was MSA which was established in 1998 by the merger of the China Ship Inspection Bureau and the China Port Supervision Bureau. Current reforms and restructuring is an ongoing process to bring CCG under a unified command structure. On June 22, new legislation passed by the National People’s Congress (NPC) in lieu with March 2018's decision which will enable the CCG to "play a bigger role in emergencies and crises, including war".